Bien Nacido is best known as a historic vineyard that has played an important role in the development of America wine by supplying ambitious winemakers with top-notch fruit since the 1970s. But Bien Nacido also makes wines under its own label. Today, they are among the finest in California. Bien Nacido Syrah is made with 100% Syrah of the Estrella clone planted in 1995. This vineyards site is at 700 ft elevation facing directly west with a view of the whole Santa Maria Valley and the Pacific Ocean past it. Soils are Los Osos clay loam, over marine volcanics. Hand harvested and fermented with native yeast, and malolactic fermentations. Aged for 18 months in French oak (30% new). 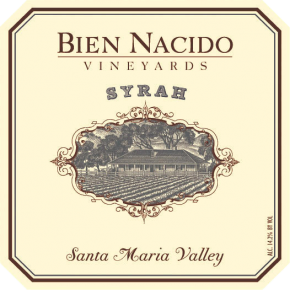 Bien Nacido Syrah offers exotic aromatics of white pepper, tapenade, tar, and violets. A cool toned entry on the meaty palate yields to firm tannins that work nicely with dark fruits and ample acid through the finish.